I have created a study guide for small group discussions. 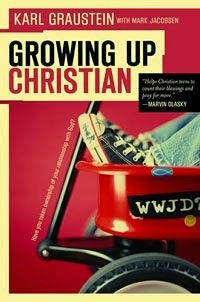 If you would like a free copy, email me through growingupchristian.com, and I will send it to you. First let me encourage you as you seek to reach the hearts and minds of the teens in your youth group or discussion group. I pray that God gives you wisdom and creativity for the task. And I pray that God will use you to help each teen develop a faith an a walk of their own. Teens are busy with school, extracurriculars, and work. Be creative in getting them to read the book before you discuss it. You may even want to take 10 to 15 minutes and have them spread out and read the chapter. This is a simple way to make sure they read it, and it will be fresh on their minds as you transition to discussion. Help your teens see the connection between the Bible and their lives today. Have them bring their Bibles to each meeting, have them read it aloud, and have them make connections to their lives today.